Is It Good? My Little Pony: Friendship is Magic #15 Review – AiPT! It’s that time again, everybody: time to toss those overly serious comics to the side and read something fun. The newest issue of the My Little Pony: Friendship is Magic. series features the start of a brand new story arc. Is it good? Weird cocoons have been popping up all over town and no pony has a clue why. When Twilight Sparkle tries to figure out what’s exactly happening, she makes the shocking discovery that her books are being destroyed; well, not so much completely destroyed as eaten by a very nasty bookworm. Twilight and a few of her friends decide to venture into the books themselves by entering the story to put them back together again and stop the bookworm (because in the reality, the bookworm is too fast to catch so naturally going into the story itself is much easier). Seems legit. Also, as you can imagine, trouble ensues. …Take a look; it’s in a book; it’s Reading Rainbow! If a certain sentence in that summary didn’t tip you off, then I’ll say it here. The whole idea and premise here is a bit silly to me, even by the standards of the series. I mean, they can’t catch the bookworm eating all the books in reality, so they decide to venture into story reality to catch him, even though it wasn’t mentioned that the creature could do that. Maybe bookworms have appeared in the series and they can do that (I haven’t been watching this recent season a lot), but the whole idea seems overcomplicated and frankly weird. Besides that, the rest of the story was fine. The idea of the characters going into the books and trying to retell the stories in order to fix them is pretty fun and led to a lot of great and funny moments (especially the Daring Doo story). The story with the cocoons is good as well (wait until you find out what they really are) and led to a solid cliffhanger. Characterization was for the most part good, though there were some odd moments with Twilight and a couple of lines she said. Nonetheless, I’m finding this arc already better than the pirate one. I think she might need to invest in a Nook or Kindle. Though Heather Nuhfer continues to write, we now have Amy Mebberson back on art duties. Amy utilizes a cartoony style that really fits the comic and feels like a nice halfway point between Brenda Hickey (previous arc’s artist) and Andy Price. She also has a great way of portraying the characters and their emotions, drawing the landscapes and backgrounds, and adding humorous things in the background. However, what I really liked here was the panels and their layouts. When the characters enter the book worlds, panels have chew marks and rips in them, as if the bookworm had come through; while the regular world just has regular panels. It helps add to the feeling that worlds are being wrecked and the characters do need to fix them. 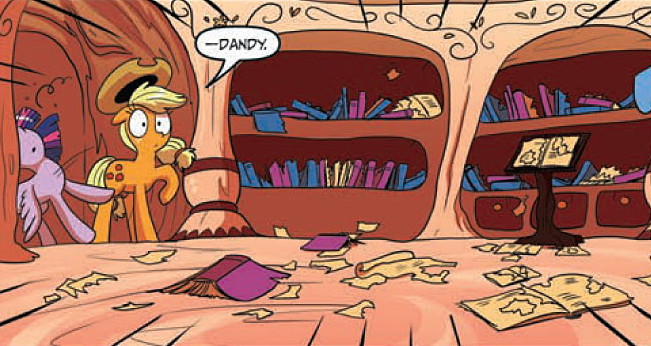 My Little Pony: Friendship is Magic #15 is an enjoyable issue and great start to this new little arc. While the basis for the story is a bit questionable, the story is a lot of fun overall and has some creativity to it. Worth a look for sure.